Delightful Pelican Lanai! Completely updated and waiting for you! Pelican L04- Beautifully updated 1 Bedroom plus bunk room Lanai level condo with an "Under the Sea-Coastal" feel throughout the condo. Welcome to Pelican L04 at DestinWest Beach an Bay Resort. If you are in need of a one bedroom condo and are tired of the same old type condos then you are going to love this condo. It is uniquely decorated and furnished with everything added to make your vacation enjoyable and comfortable. The open floor plan offers a fully equipped kitchen and a separate dining area. Large King Master bedroom, a queen size sofa sleeper, and a bunk area with a door complete the sleeping accommodations for this unit. The master bedroom has a King Bed with upscale luxury linens and bedding, a 46 inch TV and a DVD with a private bath. The bunkroom has a 20in TV w/DVD for each bunk and a private bath. The kitchen has everything you will need for a great meal or a simple cup of coffee. Stainless steel cookware, toaster oven, crock pot just to mention a few of the items that are furnished in the fully stocked kitchen. The living room has a 55 in television and BueRay DVD player, wifi internet service and a sleeper sofa with all linens needed for a peaceful nights sleep. The linens and accessories are a cut above the normal vacation rental condominium. The living room opens to a large balcony where your Island Oasis awaits you; with a table and four chairs for your enjoyment of the great outdoors and to see all the great views of the amenities of bayside at DestinWest. The balcony offers views of the bay also. 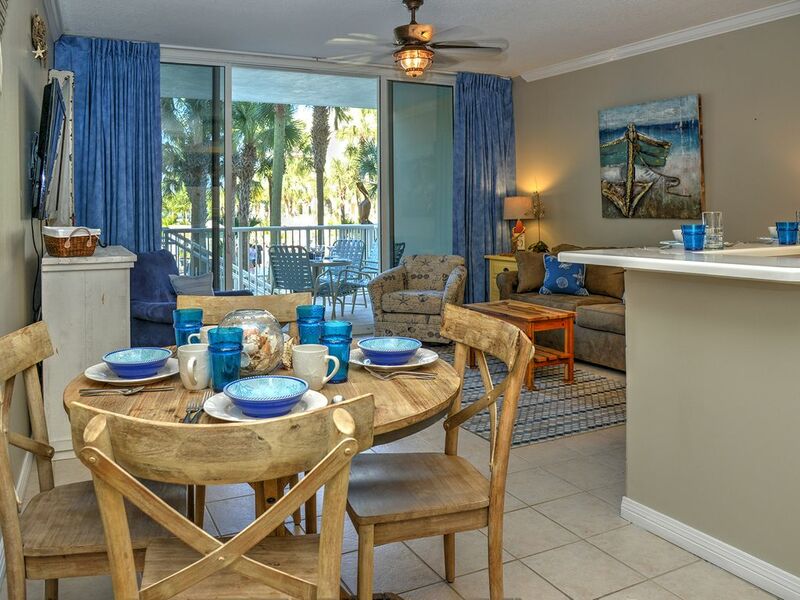 The convenience of the Lanai Level can not be beat as it is central to everything at Destin West. Right in front of the lazy river, just a short walk to the bridge to take you to the beach, very close to the hot tubs, the pool deck for the lazy river and heated pool. This condo is on the ground floor and has its own private grill for your ease of grilling with and for family and friends. It was our intent to include everything needed for your fun filled and relaxed vacation in this small package. Relax by the Gulf-side Pool, soak in one of the whirlpool spas, or enjoy an amazing sunset! This LANAI floor unit is beautiful as it over looks the unsurpassed amenities such as the Award Winning Lazy River with a spectacular waterfall! Destin is well known as the World’s Luckiest Fishing Village largely because of it roots as a top fishing destination and quick access to deep waters of the Gulf of Mexico. Destin boasts the largest charter fishing fleet in the state of Florida. If you have an interest in charter deep sea fishing – Destin is the place. But, there is much more to Destin than charter fishing. Destin has evolved over the years to be a top beach vacation destination. Featuring sugar white sand beaches and emerald colored water, it is an absolutely beautiful area. The town itself offers many upscale shopping, dining, and entertainment opportunities. Destin also has one of the busiest private airports in the country. Located next to golfing, fishing, water sports, The Gulfarium, The Emerald Coast convention Center, Shopping, Restaurants, and Entertainment! It was great! This is our 2nd spring getaway in FWB. We love the condo, and would go back again. Condo is well kept, clean and location is fantastic. We loved the pool, and Lazy River. Only wish the weather could have been a bit warmer, but that can't be controlled! Dear Ms. Luecht, Thank you for this stellar 5 star review! Pelican L-04 is one of my personal favorites with its cozy beach cottage decor and convenience to the lazy river! I had the pleasure of spending Spring Break there with my daughters last year, and although I live here year round, it was an amazing getaway experience! I'm glad it was for you as well! Please come visit again soon! Great vacation! Loved that we could walk right out to the lazy river! Dear Ms. Guillaume, Pelican L-04 is one of my personal favorites! I stayed in this condo with my girls just this past Spring and loved the convenience of its entrance to the Lazy River! We're so happy you had a great time and will be looking forward to hearing from you again! The unit was well kept and maintained. Being on the first floor was really nice when loading and unloading your vehicle and the ease of getting to the lazy river and pools was great. Dear Ms. Carstens, Thank you so much for your wonderful review! Pelican L-04 is one of my favorite units! My daughters and I actually stayed here during Spring Break this year and loved the little outdoor kitchen area and its convenience to the lazy river. I'm so glad you enjoyed your time here as well! We'll be standing by to help you book your next visit whenever you're ready to come back! Our family had a really great time! The heated pool was located very close to our rental. The beach and restaurants were just across the bridge and the garage full of sand toys was “a hit” with our kids. The property had everything we needed and the property management company was great to work with and prompt to respond to inquiries. We would definitely go back. Pelican L-04 is one of my very favorite units! I'm so glad you enjoyed it as much as my family and I have. We look forward to having you back again soon! We had a great time! Loved the condo and would love to stay there again. The pool, lazy river and the beach were terrific. We didn't want to leave! Dear Mr. Luecht, The Island does have this effect, doesn't it? My daughter, her best friend, and I were all able to stay in this very same unit and had such a great time, we didn't want to leave either! Alas, we had to vacate the premises, as this is a busy little condo for this time of year and understandably so. It's convenient location to the lazy river and the out door kitchen area was a real treat for our little "stay-cation". I'm so glad you had a wonderful time. We can't wait to have you back again and will eagerly await your next booking! 2nd year to stay at Destin West! Our family loves it!! **All reservations require either a $49 property damage protection fee which covers up to $1500 in damages or a $500 refundable security deposit. Reservations made online will be billed the $49 automatically unless we hear otherwise from the guest. ***This condo may have (check with us if you are unsure) a private hot tub that is optional for our guests. The fee to use the hot tub is $50 plus tax and will be added to the quote given by VRBO unless we are contacted to state not wanted. ****Booking dates must be agreed upon by management company and guests. Minimum dates listed are not guaranteed for rental. For any questions on rentals less than our usual 6 night minimum, please contact us for confirmation. *****New Reservations using American Express will have a 2.5% credit card fee added to total.